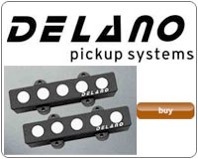 The pickup is probably the most important part of your bass, it is responsible for your ability to hear the tone of the instrument as efficiently as possible. Many mass-produced instruments use very cheap pickups that give a poor quality signal to your amplifier and often colour your sound or miss large areas of frequencies making your instrument sounds thin, harsh or boomy and dull. Installing a good set of pickups can transform a bass guitar, and in most cases it makes sense to put higher quality pickups in your bass first rather than a preamp. Are my Pickups Active or Passive? EMG - Active Pickups. Require 9v battery power for operation. If the EMG model notes Hz, then they are passive. 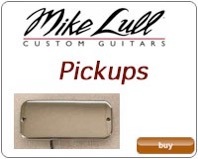 An active pickup is a pickup that uses an electronic form of a preamp built into the pickup to gain enhancement, tonal shaping characteristics, and or output impedance reduction. Some advantages to using active pickups is that they are less susceptible to noise and can have greater flexibility of eliminating the high frequency losses caused by driving long cables or sending the signal through multiple pedal effects. EMG and some Seymour Duncan pickups are examples of Active Pickups. Passive pickups require no internal circuitry or external power via a battery for operation. 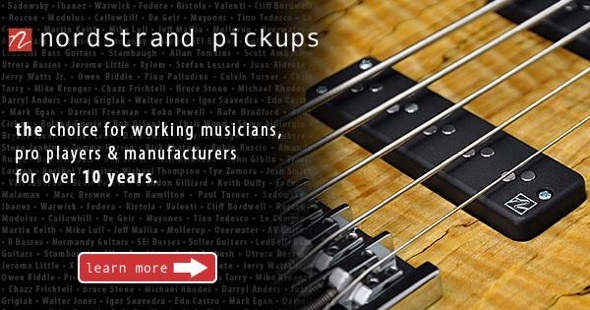 Nordstrand, Lindy Fralin, Bartolini, and Delano's are examples of passive pickups. Many players feel that passive bass pick-ups have a more organic tone and a wider dynamic range.The end result of this is that the vast majority of pickups sold are of the passive type.players feel that passive guitar pick-ups have a more organic tone and a wider dynamic range. The end result is the vast majority of pickups sold are of the passive variety. CanI use active pickups with my preamp? This depends on the pre-amp being used. Audere preamp's are not recommended to be used with Active pickups such as EMG's and some Duncan's. Other pre-amp's, provided the control potentiometer's are impedance matched, i.e 25k Ohm Volume and 25k Ohm Blend are used, can be used with Active Pickups. Consult us for more clarification. What pickups fit my bass? This varies from instrument to instrument. To understand what pickups fit the route on the bass the dimensions of length and width would have to be taken and compared to models currently produced. If a model is not comparable to an off the shelf option please contact us and we can discuss custom options if applicable for your instrument. Moving a pickup closer to the strings produces higher output, and when the pickup is farther away less output. Moving the pickup closer to the strings causes the string vibrations to increase the amplitude of the disturbance in the magnetic field, which in turn creates stronger current on the output. This does affect the tonal characteristics as when the pickup is closer the bass tends to become "boomier". Also placing a pickup to close the strings cause the string vibration to decay faster than normal. The pickups can also be adjusted on a slope with one side sitting lower or higher than the other. Depending on the orientation the tonal characteristics of the pickup are also changed. For instance if the bass is too "boomy" from the neck pickup and the treble is thin, you can adjust the bass side lower and the treble side sligthly higher to compensate. Because the pickup is at a slanted slope the change between the frequencies will be gradual,linear, and fall off on the bass side. Many manufacturers have different specifications. These are not concrete dimensions. They are a guideline. As each bass is not identical and not two instruments sound the same, some experimentation on height can be accomplished. Ideally the instrument will need to be set up and intonated as desired before making height adjustments. Consult the manufacturers specifications for a reference point. Do pickups come with screws? 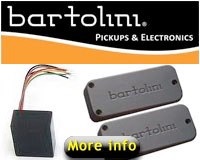 Bartolini - No Screws Supplied. EMG - Black Screws Supplied. Lindy Fralin- Chrome Screws Supplied. 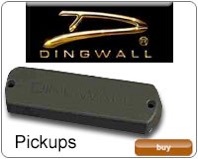 Dingwall - No screws supplied, apart from the conversion kits. Yes and No. A Single coil matched set with the pickups being reverse wound reverse polarity of each other are hum cancelling. With these pickups being evenly blended the output will have little hum. 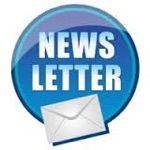 If one pickup is soloed or rolled full on, some "hum" can be expected to be experience. Single coils can pickup some stray RF( radio frequencies ). This is what led to the humcancelling pickup being created. What string spacing do I need to know for my pickups? The string spacing tapers down the instrument until the strings finally reach the nut. The dimensions for string spacing for use as a reference and or measurements for custom pickups have to be taken over the pickup. My bass is equipped with Bartolini MK's, what pickups can I use? The basic option is to use a Bartolini MK4 for 4-string, MK5 for 5-string, and MK6 for 6-string. A P2 sized pickup can also be used and is narrower in width by 2mm. 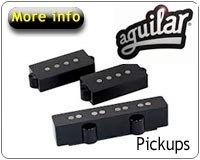 P2 sized pickups are manufactured by Bartolini, Nordstrand, Delano, and Aguilar for more tonal options.